The surviving members of Monty Python have little use for solicitors and lawyers, no matter how silly their walks might be. They have good reason, measurable in pounds. After fighting a nuisance suit for years, the Pythons found themselves holding a mountain of legal debt. Not getting any younger, they wanted to pay it all off as quickly and cleanly as possible. For Monty Python that meant returning to live performance. Roger Graef OBE & James Rogan document the preparation and behind-the-scenes camaraderie of their resulting sold-out stadium shows in Monty Python—the Meaning of Live (trailer here), which screened as part of a Python celebration at the 2015 Tribeca Film Festival. Meaning of Live should not be confused with The Meaning of Life or The Life of Brian (which also screened at Tribeca) and it certainly should not get mixed up with Douglas Adams’ The Meaning of Liff. This is strictly a fan’s eye view of the Pythons at work and in-performance. Fortunately, they are all still pretty funny, so you never know when they are going to unleash some of the old magic. 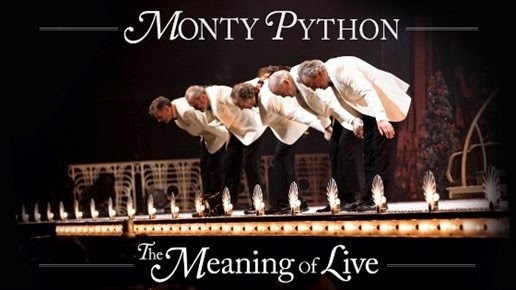 Yes, this is all about paying tribute and singing along to “Always Look on the Brighter Side of Life.” However, there are some interesting tidbits to be gleaned on the economics of a Monty Python farewell concert. Evidently, it is so costly to rent London’s massive O2 Arena, you really need to play for about a week to get into the black and you will not have the luxury of much tech rehearsing in the actual space. Hence, the Pythons signed on for ten shows. Frankly, they should have just added three or four shows in order to finally finance Terry Gilliam’s Don Quixote. Yes, even though Gilliam was never much of an on-camera guy, he does his part in classic skits as a full-fledged member. One-for-all, after all. 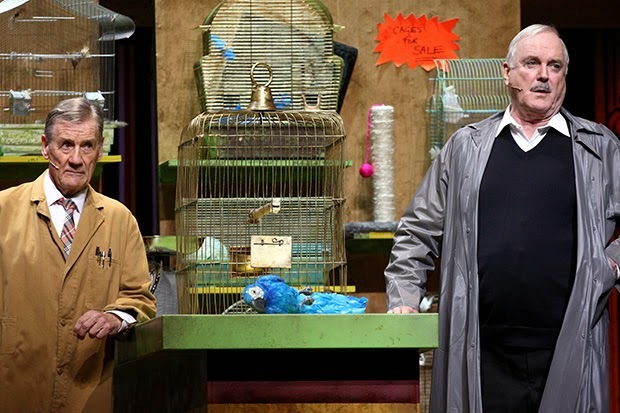 Part of the fun of Live is watching the fun the Pythons are having being together again. That is more than a little fannish, but they’ve earned it. However, there are also a few notable cameos, ranging from the heart-warming (Carol Cleveland once again performing with the randy lads) detouring through the lameness (Mike Meyers taking a pointless walk-on) to the truly surreal (Stephen Hawking singing the “Universe Song” through his computer voice-box). Of course, we also get plenty of bite-sized servings of classic call-backs. The parrot is still dead as a doornail and the lumberjack still likes to dress up in women’s clothing and hang around in bars—and it is all still good stuff. However, perhaps we had better enjoy it while we can. How long will it be before the professional comedy scolds tell us it is inappropriate to laugh at the lumberjack sketch or any of the dozens of other politically incorrect gags in the Python repertoire? You sort of have to be a fan to appreciate Meaning of Live, but there are plenty out there. More consistent than A Liar’s Autobiography but not nearly as comprehensive and authoritative as Almost the Truth—the Lawyer’s Cut, Live is basically a breezy curtain call, but it will definitely tide fans over until their next absolutely final farewell project. Recommended accordingly, Monty Python—the Meaning of Live screens today (4/28), Saturday (5/2) and Sunday (4/3) at Hot Docs up north, following its international premiere at this year’s Tribeca Film Festival.